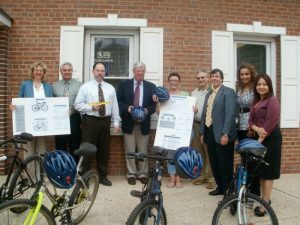 The Hudson TMA provides programs to encourage commuters to use a bicycle whenever they can. Unfortunately, there are many adults who would like to use a bike as part of their commute, but cannot afford one. The Hudson TMA Bike Rehab program works to address this problem. The TMA receives donated bicycles and rehabs them. In partnership with the Hudson TMA, Community Action Programs and social service agencies in Hudson County help us to identify and register eligible individuals for the program. Recipients not only receive a bike, but a helmet and a brief instruction in cycling safety. Anyone wishing to donate an adult size bike in working order w/brakes, no rust and no bent frames or wheels, can do so. Apartment and condo managers can call directly to arrange for a pick up for a donation of several bicycles. Call the TMA 201-324-6222 or email info@hudsontma.org. Monetary donations are also appreciated.